Time passes so quickly! And embarrassingly it’s been ages since we put some news on this website. Our Facebook page won the battle in terms of Christmas updates, but it’s not as if things haven’t been going on! ‘Camberwell Scare’ at the start of November last year must have been one of our most successful concerts ever – who would have thought a 1923 horror film and a live performance from a community choir would work? But it did – and it was so popular we might have to do it again this year! Our Christmas Concert was loads of fun too with a record audience turnout. ‘Carols ’round Camberwell’ was a bit damp, what with a thunderstorm starting just as we set out to sing! But we raised nearly £200 in 45 minutes towards the Philippines Typhoon appeal which meant it was well worth soggy clothes (and music). But now to 2014 – and you can be sure that our music choices will remain eclectic as ever! But throughout the year, there will be some songs popping up commemorating the 100th anniversary of the Great War, 1914-18. World War 1 got underway in the era of gramophones and perhaps more than ever, music on the home front and music on the front lines were connected like never before – often with some ‘edited’ lyrics by soldiers! A great example is the song ‘They didn’t believe me’ from ‘The girl from Utah’ by Jerome Kern and Herbert Reynolds. Arriving in Britain from the US in 1914, it became an ironic take on the allegedly ‘easy’ life of the trenches in the early part of the war. 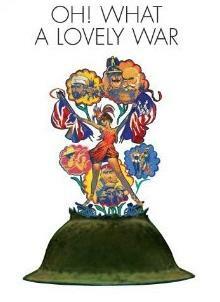 It was featured under another title ‘We’ll never tell them’ at the end of ‘Oh what a lovely war’, which is a bit of a hot topic for MP Michael Gove at the moment! We will be rehearsing this song at the next rehearsal with Ashley. Anyway – even two rehearsals in – it’s never too late in the term to come and join us! And if you’ve visited us before, why not make a New Year’s Resolution to make music a part of your life in 2014?